James Sweeney is a native of Omaha, Nebraska. He completed his undergraduate education in 1995 at South Dakota State University, earning a Bachelor of Science in Biology. He was commissioned a Second Lieutenant in the Marine Corps through the Platoon Leaders Course in December 1995. Following The Basic School and the Infantry Officer Course, he was assigned to 2d Battalion, 3d Marines, 3d Marine Division at Marine Corps Base, Kaneohe Bay, Hawaii in November 1996. During this tour, Lieutenant Sweeney served as a rifle platoon commander with Fox Company and the heavy weapons platoon commander with Weapons Company during two Unit Deployment Program (UDP) deployments to Okinawa, Japan and the Republic of Korea. Additionally, he served as the Weapons Company executive officer. 1st Lieutenant Sweeney was promoted to Captain in January 2000 and was assigned to Second Fleet Antiterrorism Security Team (FAST) Company in Yorktown, Virginia. During this tour, Captain Sweeney served as a platoon commander deploying to Naples, Italy as the Commander, US Navy, Sixth Fleet FAST platoon. During this deployment, he provided security for the Maritime Pre-positioned Ship USNS PFC Eugene A. Obregon during an offload at the port of Thessaloniki, Greece. During a subsequent deployment with FAST, Captain Sweeney’s platoon provided security at the Puget Sound Naval Station for the nuclear de-fuel and decommissioning of the USS L. Mendel Rivers. Following this assignment, Captain Sweeney served as the Second FAST executive officer and received orders to the Expeditionary Warfare School, Quantico, Virginia in August 2002. Upon completion of career level school in June 2003, Captain Sweeney reported to Officer Candidates School where he served in the operations section as a summer augment until September 2003. Captain Sweeney then reported to the 3d Marine Regiment at Marine Corps Base, Kaneohe Bay, Hawaii for duty as the Commanding Officer, Company I, 3d Battalion, 3d Marines (3/3). While in this billet, he deployed with I/3/3 to Afghanistan in support of Operation ENDURING FREEDOM. 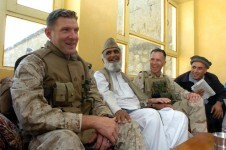 Upon return from Afghanistan, Captain Sweeney was assigned as the operations officer for 3/3. He was promoted to Major on 1 January 2006. As the operations Officer he deployed with 3/3 to Iraq in support of Operation IRAQI FREEDOM 05-07. 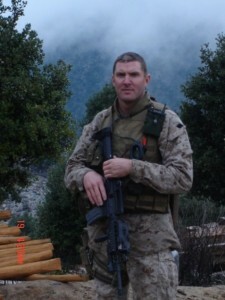 Following the deployment Major Sweeney served as the operations officer for 3d Marine Regiment. Major Sweeney attended the Australian Command & Staff College in 2008 as an Overseas Course Member in Canberra, Australia and upon graduation was assigned to a Joint Billet in the Policy Division of Special Operations Command Pacific. During this tour, Major Sweeney served as a policy and security sector officer coordinating policy discussions, interactions, and dialog with U.S. and foreign security sector personnel with interest in the Asia-Pacific region. In June 2010, Major Sweeney was assigned as the Operations Officer for The Basic School, Quantico, VA. After serving as the Operations officer for one year he was assigned to his current billet as the Warfighting Director for The Basic School. Lieutenant Colonel Sweeney was promoted to his current rank on 8 September 2012. 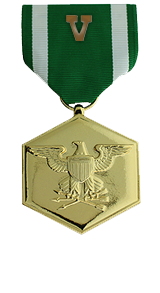 James Sweeney’s personal awards include the Defense Meritorious Service Medal, Navy and Marine Corps Commendation Medal with combat distinguishing device and gold star in lieu of second award, the Joint Service Achievement Medal with oak leaf cluster and the Combat Action Ribbon. He is married to the former Mattie Hansen of Dallas, TX. They have two daughters, Alana (12) and Gemma (5). Heroic achievement in connection with combat operations against the enemy while serving as commanding officer, Company I, 3d Battalion, 3d Marines, Combined Joint Task Force-76 from November 2004 to June 2005, in support of operation enduring freedom. Captain Sweeney’s exceptional leadership and performance significantly improved the combat readiness of his company. Under his leadership, company i significantly contributed to improving the security environment in Afghanistan. His company’s sustained duration operations and presence in the volatile Pech District denied Al Qaeda and associated movement forces safe haven in an area where they had long been entrenched. During engagements, Captain Sweeney demonstrated superb leadership and proficiency under fire. In one of these engagements, he ran under enemy fire to a mortar position to direct the Marines to conduct direct lay fire on an advancing enemy and successfully repelled the enemy assault. 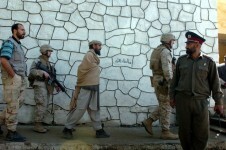 His actions set the security conditions needed for successful national assembly elections in the Konar Province. By his enthusiasm, professionalism and unwavering devotion to duty, Captain Sweeney reflected great credit upon himself and upheld the highest traditions of the Marine Corps and the United States Naval Service.